For me it all began in the mid-1970s with the publication of Richard Mabey’s ‘The Unofficial Countryside’. As a naturalist and proto-conservationist, I had grown up fascinated by wildlife in close proximity to humans, in those places without a name apart from ‘wasteland’; at last there was a suitable, non-pejorative name for the places I inhabited as a child, chasing butterflies, building dens, and generally finding my own space. My fascination with the unofficial countryside has remained unabated. As a professional conservationist one of my proudest achievements was the safeguarding of Canvey Wick (see blog), and the acceptance of what had now become called brownfield or post-industrial land, as having a legitimate part to play in ’proper’ nature conservation. Forty years on, and there is a new book, introducing a new name – The Orphaned Spaces – written by MW Bewick and illustrated by Ella Johnston. And a new approach, going behind the science and the evident conservation values, into the personal reflections on how such places help mark the passage of time and of our lives. The poetic prose transports me to every orphaned space I have ever been and conjures up the unpredictable magic of the interface between human decay and natural bounty. Written in diary format, mostly during the winter months, it also succeeds for me in highlighting the role of such places in guiding us through the low season. I am one of those who lives in the shadow of the winter gloom, from autumn equinox until the advancing daylength of January; the improbable pinpricks of nature which adorn our orphaned spaces are essential signposts to a brighter future. This book thus neatly bridges one Mabey theme – Unofficial Countryside – to another – Nature Cure. Travelling thugs on the banks of the river by the derelict furniture warehouse. Giant hogweed and Himalayan balsam are rough brutes. The sewerage pipe trickles into the murk of almost stagnant water and the banks are littered with human detritus. A muddy trainer. Plastic bottles and old tin cans. A jumper. A half-submerged supermarket trolley. Just who is the invasive species? …thus taking this book into the sphere of natural philosophy, giving voice to some of the questions which need repeating over and over in the modern world of spurious civilisation. Of course as a scientist and therefore a nit-picker, I have my quibbles. The failure to observe standard typographic representation of scientific names for example. And the assertion of 1 May that ‘There is unique quality to overlooked spaces. More bio-diverse than an arable field.’ – damning with faint praise, to anyone with an ecological background. But such quibbles miss the point of the book…and the fact that I happily read it in one sitting should speak volumes. And then there’s the subtitle. ‘The Orphaned Spaces: Waste ground explored’. Yes, maybe we called it wasteground as kids, but the adjectival use of ‘waste’, without even ironic quotation marks, upsets me greatly. And I think to anyone who approaches this book with an enquiring mind, you will find its thoughtful contents give the lie to the subtitle. 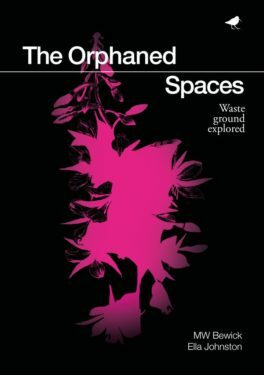 ‘The Orphaned Spaces‘ by MW Bewick & Ella Johnston, publisher Dunlin Press, 2018. Price £9.99 from Dunlin Press Online Shop. Also available is a made-to-order boxed set, which should be a thing of beauty as well as a stimulating read.